Forecasting a future where satellite networks reach into vastly more ships, airplanes, homes and businesses, SES announced Monday it will buy at least seven high-capacity broadband and data relay satellites from Boeing for launch in 2021 into a rarely-used orbit several thousand miles over the equator. Building on a model SES says has been successfully demonstrated by O3b, which has launched 12 satellites and has eight more under construction, the “O3b mPower” program will beam broadband connectivity into many more parts of the world, meeting the entire data traffic needs of some small countries, officials said in a press conference Monday at Euroconsult’s annual World Satellite Business Week meeting in Paris. The new satellites will have more power than O3b’s current constellation, and SES selected Boeing — not Thales Alenia Space, the builder of O3b’s existing satellites — as prime contractor for O3b mPower’s space segment. 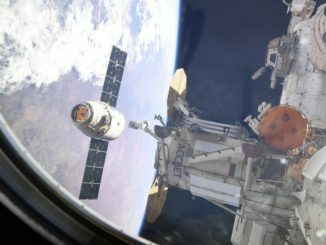 The announcement was short on technical details, and SES and Boeing officials declined to answer questions on the mass and power level of each spacecraft. The satellites will launch into a unique equatorial orbit, the same type of “medium Earth orbit” currently populated by O3b’s network, which flies around 5,000 miles (8,000 kilometers) over the equator, making five orbits of the planet each day. Officials did not disclose the altitude of the planned O3b mPower fleet, but the seven satellites announced Monday will be parked in orbits directly over the equator. SES could add more satellites to the O3b mPower network at higher inclinations. Karim Michel Sabbagh, president and CEO of Luxembourg-based SES, said the company is not investing any more money in O3b mPower than was already planned in its capital expenditure forecasts. Sabbagh declined to put a financial value on the O3b mPower investment, but he said SES will cancel plans to replace two of its aging large geostationary communications satellites, a move that will offset the cost of O3b mPower. Like the current O3b fleet, the new satellites will beam low-latency broadband signals to terminals on the ground. But O3b’s satellites each host 10 broadband beams, while each O3b mPower will have 4,000 beams. In hindsight, the O3b mPower program was telegraphed by SES officials years ago as they discussed internal debates about whether to buy smaller, shorter-lived satellites that could be adapted to meet new user demands years after their launch. SES first invested in O3b in 2009, then took 100 percent ownership of O3b in 2016. The O3b network was originally envisioned as a way to connect the estimated three billion people — the “other 3 billion” — without Internet access. “This takes the idea of O3b and dramatically scales it to tens of thousands of end points, to communities whether they be villages, towns or cities, whether it’s every aircraft that’s flying in the world, every cruise ship, every vessel, every government requirement can be addressed ultimately within the O3b mPower ecosystem,” Collar said. 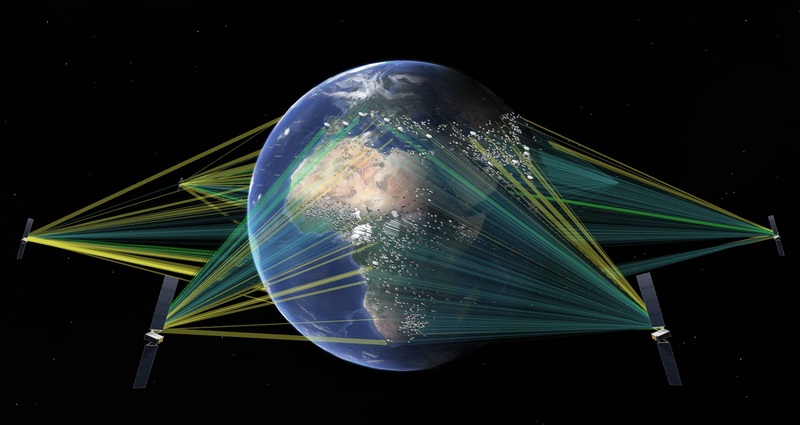 The ground terminals will have internal computers and data storage capacity, allowing them to switch between the O3b mPower network, broadband from SES’s geostationary satellites and ground-based connections, enabling near-global coverage. “This is a step change in terms of SES’s capability, but I actually think it’s a step change in terms of the way that satellites respond to future demand,” Collar said. O3b’s satellites in equatorial orbit can reach customers between 45 degrees north and south latitude. O3b Networks is now beaming Internet connectivity to service providers and telecom operators in Africa and the Pacific islands, reaching customers in South Sudan, Madagascar, East Timor, Samoa, Nauru and Papua New Guinea, among other countries. Collar said O3b is delivering more bandwidth to Royal Caribbean’s cruise ships than the rest of the maritime industry combined, and beaming 50 percent of the bandwidth used in Kinshasa, capital of the Democratic Republic of Congo. SES says O3b, and O3b mPower in the future, will offer fiber-quality network connections without the need to lay cable in remote, rugged terrain. “We have unlocked a market we didn’t think we could unlock with the current O3b system,” Sabbagh said. “Having said that, we always knew from the beginning that the current system is confined to 200 beams, so nominally to 200 clients … If you want to think about it in terms of a comparison, it’s 10 beams vs. 4,000 beams per spacecraft. It gives you an idea of our ability to democratize the delivery of the service and to be able to enable all those market segments. 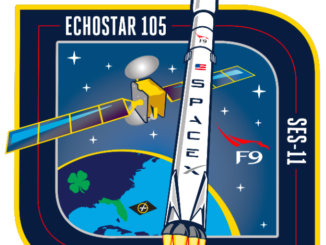 SES has not selected a launcher for the O3b mPower satellites. Depending on the launch site and the rocket, three or four O3b mPower spacecraft could fly on the same booster. O3b’s 12 spacecraft already in orbit launched in groups of four from French Guiana on Europeanized Soyuz rockets marketed by Arianespace. Two more O3b launches — each with four satellites — are reserved on Arianespace Soyuz rockets for flights in 2018 and 2019. Collar said the O3b mPower satellites are not restricted to launching from French Guiana, a spaceport located in South America around 5 degrees north latitude. 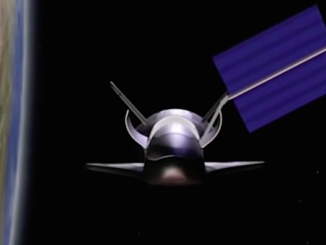 Each spacecraft will have efficient electric propulsion thrusters, giving them the ability to maneuver over the equator even if launched from higher latitude sites like Cape Canaveral, Collar said. “We do not have to focus on a single launcher,” Sabbagh said. 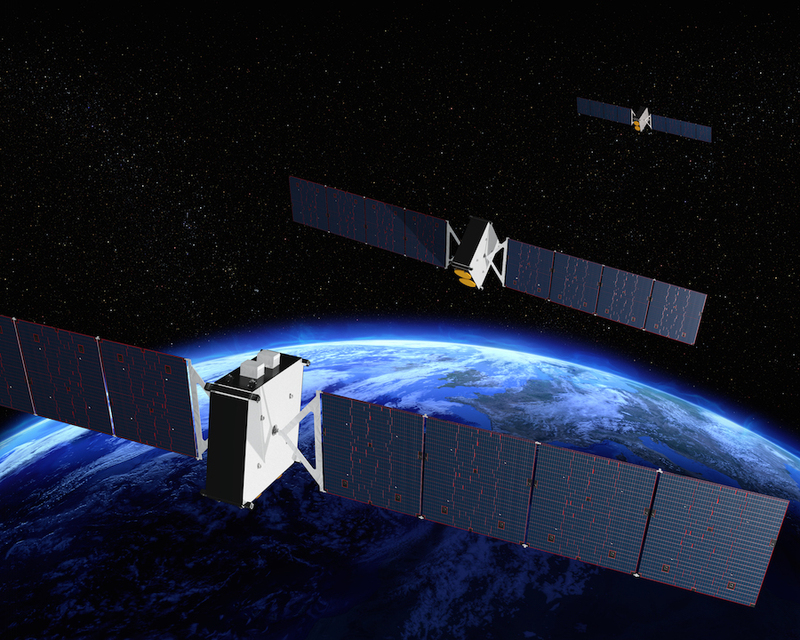 Paul Rusnock, chairman and CEO of Boeing Satellite Systems, said the O3b mPower platforms will carry newly-designed phased array antennas not yet flown in space. The satellites are based on a new design, with electronics and avionics from Boeing’s 702 geostationary spacecraft bus.